The lawyer was John Adams, newly-appointed representative to what is now known as the First Continental Congress. Attending this assembly risked his ability to support his family, not to mention his neck. 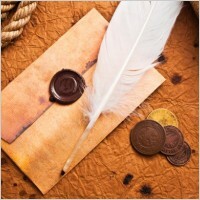 He could have been tried for treason against the British crown, but he and his wife Abigail both agreed he should go. 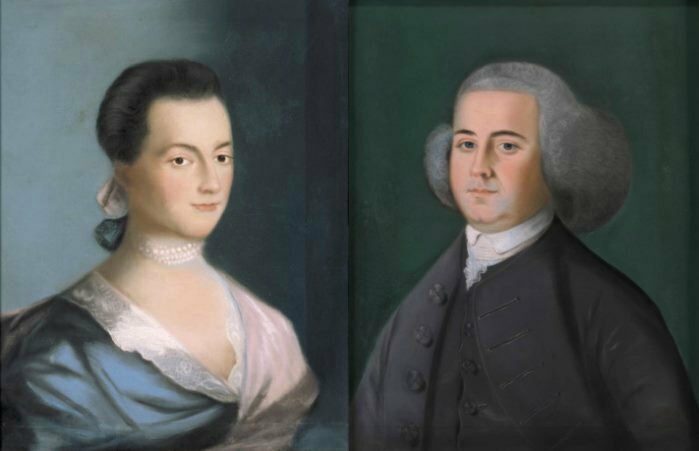 Mr. and Mrs. Adams had already forged their marriage into an equal partnership, surprising not only because of the era, but because of the nine year difference in their ages. As a child, Abigail had not been permitted to attend school. Her mother feared too much learning would ruin her health and sully her mind. As an adult in 1774, she could not legally act in her own interest, for the law did not recognize her as a person separate from her husband. She had not permitted the repressive atmosphere of the era defeat her. Thanks to the books in her father’s and grandfather’s libraries, she was well read. When 14-year-old Abigail Smith first met 23-year-old John Adams, he described her to a friend as “quite lacking in tenderness”. Always forthright, teenage Abigail refused to curb her tongue for the benefit of a pudgy lawyer. Within a couple of years, however, he was writing flirtatious letters to ‘Miss Adorable’ or ‘Diana’ and she replied in the same vein to her ‘Lysander’. (Presumably she referred to the Shakespearean lover.) After their marriage in 1766, their mutual salutation became ‘My Dearest Friend’, and deep-seated expressions of love replaced flirtation. As a lawyer, John had to ride a circuit of Massachusetts courts to make a living, which required him to leave Abigail and their growing family for days or weeks. Over the decades of John’s public life, they would exchange over 1200 epistles, not counting those that didn’t make it through enemy lines during the Revolutionary War or otherwise go astray. Their correspondence ranged from brief notes when government or diplomatic business took up most of John’s time, to long letters composed over several days. Both the Adams must have found writing therapeutic, for at different times, they referred to it as a way to soothe inner turmoil. Separation meant their disagreements also had to travel back and forth between Braintree and Philadelphia and eventually, across the Atlantic. Many involved the education of their sons and surviving daughter. And when John made the mistake of writing to Abigail how much he admired the cultured ladies of the French court, she retorted with a sharp complaint about how American girls were routinely mocked when they showed off their educations. In her jealousy, she might have forgotten her effusions on meeting George Washington in 1774. “You had prepared me to entertain a favorable opinion of him, but I thought the half was not told me. Dignity with ease and complacency, the gentleman and the soldier look agreeably blended in him. Modesty marks every line and feature of his face.” In the parlance of an 18th century New Englander, this was total fangirling. John couldn’t have enjoyed her description of the tall, charismatic, and charming General. She had been his sounding board for years at this point; he trusted her more than any other advisor. John returned home later that year, where he was named to the Massachusetts Constitutional Convention in Cambridge, the body responsible for writing the state constitution. John wrote the first draft of the document, reading it to Abigail when he returned to Braintree at the end of each week. He also discussed the assembly’s debates with her, which gave her a grasp of issues of the day. His draft was accepted with minor changes, and is still in effect. It is the oldest state constitution in continual use. In September of 1779, John was named minister plenipotentiary to France by Congress. The position gave him full power to negotiate a peace treaty Britain, along with fellow ministers Benjamin Franklin and John Jay. To Abigail, this meant another separation. John guessed the peace talks would take six months, and then he would come home to her. Instead, the couple would not set eyes on one another for five years. After the War of Independence ended, Abigail could travel to Europe without fear of being captured or sunk by an enemy ship. She met John in France in 1784. When Congress selected him as the first American ambassador to Great Britain in 1785, they moved to London. The following years brought John to two terms as vice president under George Washington, then to the Presidency. While Abigail did not always move to Philadelphia or New York with John, she was the first First Lady to live in the White House. Together or apart, he sought her opinion on policy, though at times her devotion blinded her, such as when she supported him on the Alien and Sedition Acts that contributed to his political downfall. The deaths of their daughter Nabby and their second son, Charles, marred their old age. John and Abigail took consolation in their grandchildren; Nabby and all three of their sons had married and started families. As a grandfather, John spoiled the youngsters with sugar plums while Abigail was the disciplinarian. When she died in 1818, he was at her side. To their niece Lucy Cranch Greenleaf, John said, “I wish I could lay down beside her and die too.” He later eulogized his wife as “The dear Partner of my Life for fifty-four Years and for many Years more as a Lover.” Truly they deserve to be remembered not just on Presidents Day, but on Valentine’s Day as well. 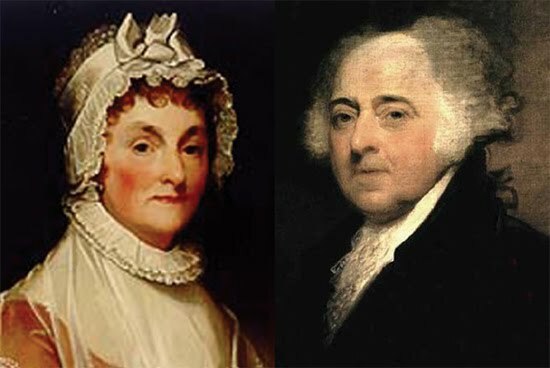 John and Abigail Adams are fascinating both as a couple and as individuals. Do you have any favorite ‘Valentine couples?